Horse en route to the paddock. I’ve often wondered what it was like to be there at my hometown’s meet, nothing fancy, just local racing and the cross-section of society having a good time. Rillito Park is probably the closest I’ll get to the days of the Memphis Jockey Club. The tiny oval located less than ten minutes from campus is where I’ve spent my weekends since the meet began Jan. 16. Parking is free, admission to the grandstand is free, programs are cheap, the crowds are friendly and you really can get close-up to the action. I went opening day with my boyfriend, a native Tucsonan who had never been to the track. We spent all afternoon running from the paddock to the windows to the rail for the races, with some exciting moments in-between. At the chain-link paddock fence before the first race, I pointed out details about the horses and explained a little about what the data was all about in the program. Many of the horses looked like they had come from colder climates and had fuzzy coats but all of them were well-groomed and on their toes. 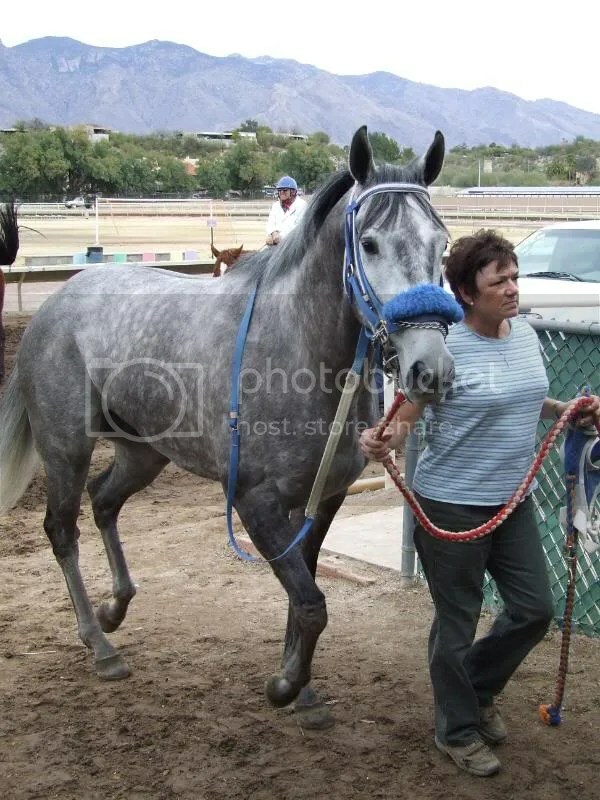 RTIP classmate Ernesto Avalos leads Divalicious from the paddock to the track at Rillito. By far, the best-looking horse in the field of 8 was a chestnut named Southern Irish: he was taller, more muscled and had a sleeker coat than any of his rivals. Boyfriend also being Irish, that sealed the deal. I made a couple of notes on the program and decided what sort of wager to place, then went up to the window and boyfriend watched in awe as I told the teller my bet. I assured him he’d be as good at it by the end of the day, and we headed to the rail. The track is situated in the foothills of the Catalinas, with grandstand views dominated by their jagged peaks. In the afternoons, the shadows shift and colors change, creating a majestic backdrop for the equine drama on the track. At the very least, it takes your attention away from the soccer fields in the infield. Only eight horses make up a full field at Rillito because the oval is so narrow. To give a little perspective, the Kentucky Derby can have a full field of 20, or 2.5 times wider than Rillito. Another thing I found delightfully quirky was the 2-turn 6furlong sprint! But that’s Rillito. Boyfriend and I watched the horses parade to the gate, confident in Southern Irish’s chances: he still looked like a horse among ponies. The race itself was a 300-yard dash for quarter horse maidens with a purse of a whole $2000. We stood about halfway between the gate and the finish line, a great spot to experience the thundering hooves. It was over quicker than the post parade. Southern Irish sprang from the gate like a jack-in-a-box and never looked back. Jockey waits for "Riders Up!" Only a dumb pick for place in the exacta kept me from cashing the ticket. Back to the paddock we went to observe for the next race. 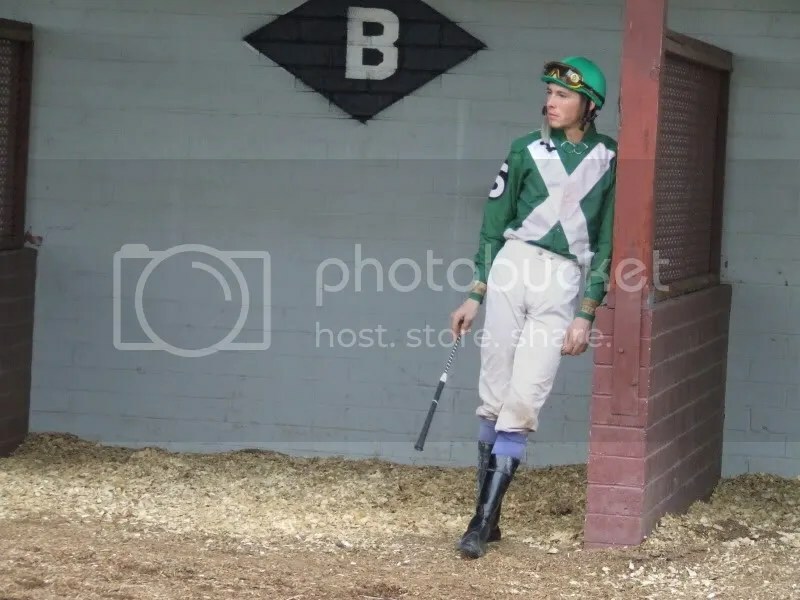 The jockeys ranged in size from pocket to tall drink of water (well, at least as tall as me, and I ain’t no jockey;-) and they wore house silks in the post position colors. As the afternoon wore on, the crowd picked up; I ran into most of my RTIP classmates; boyfriend and I watched races from vantage points all around the stretch, from behind the winner’s circle to the far end of the chute, picked a few winners and had to wait for the schoolbell to ring before I could cash the ticket (hehe!). Drama before the third race: two horses flipped in the gate as the others were loading, a scary situation that took over 15 minutes to sort out. Thankfully, both horses were extricated from the gate unharmed. 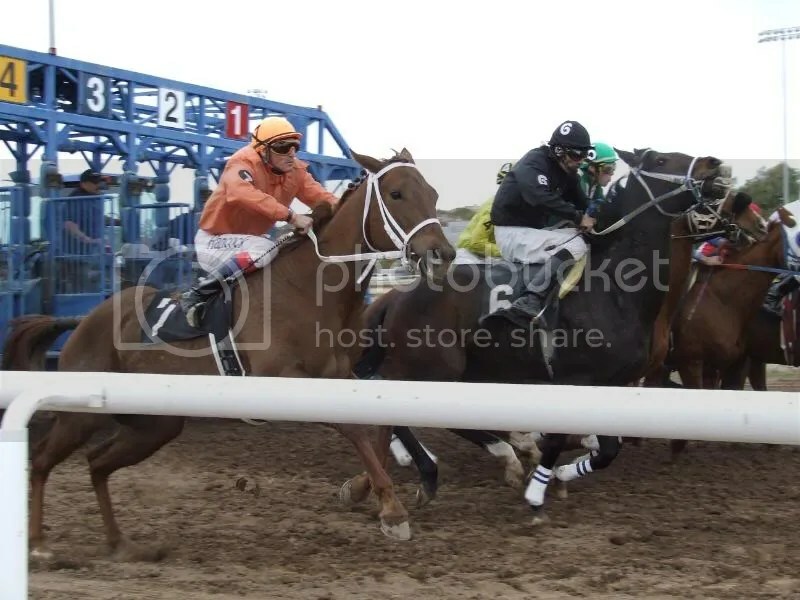 The tense situation spilled over into the race itself when the inside horse, a first-time starter, dumped her jockey at the break and then jumped over the inside rail! 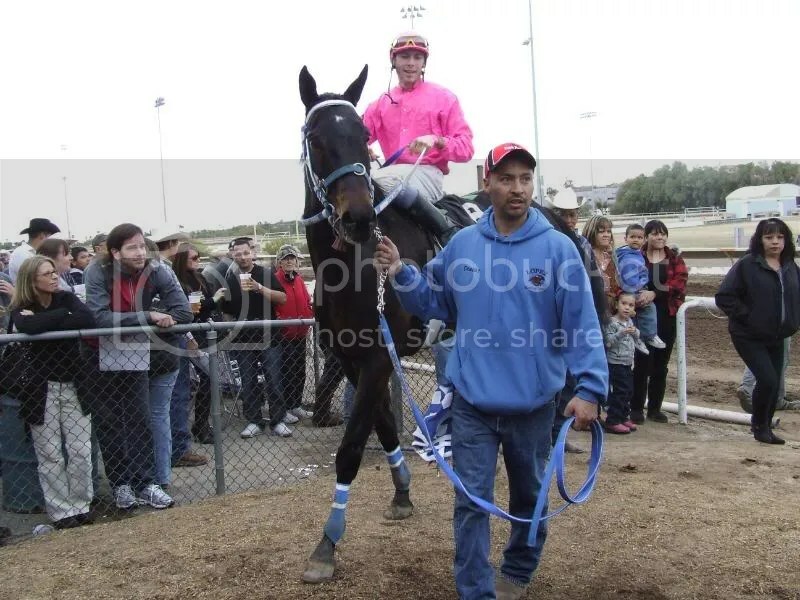 The jockey walked away with bruised pride, and the horse got to romp around the soccer fields. I don’t remember which horse won the race! Around the 6th race, boyfriend decided to place a few wagers, one based on a tip we’d gotten from a classmate. There was an Irish-bred who must have taken a wrong turn at Albuquerque and ended up in Tucson. As the sun slipped lower in the western horizon, the capacity crowd pressed against the rail and watched the sorrel Irish-bred sprint first across the wire. Our cheers echoed through the grandstand and up into the purple shadows of the mountains. 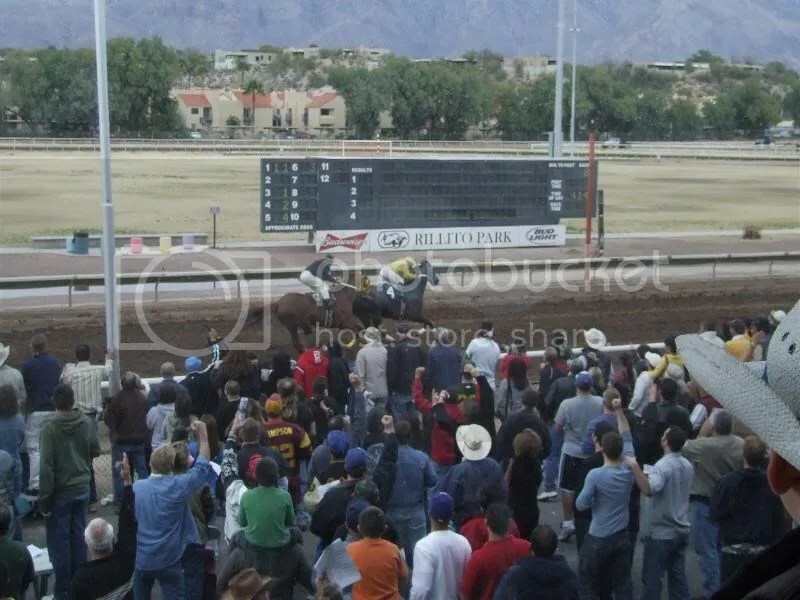 Rillito may just be a little bullring out in the desert, but at that moment I could have been at Churchill or Oaklawn or even old Montgomery Park, among the electric crowds who love racing. I’m a sucker for Tauruses. Guys born under the sign of the Bull just do it for me: they’re strong and sturdy and steady, even-tempered lovers of life. Cancer girls like me are astrologically compatible with them, as they enjoy the comforts of home that we can provide. They’re creative and loyal and funny, and if you’re a Taurus reading this now, you can find me on MySpace AND Facebook! They also have Derby Birthdays! Not all of them were actually born on Derby day of their birth year, but they share a date with many winners in history. Here are a few of my favorite Men of the Derby! Charismatic won the Derby that year. I didn’t talk to H.B. much after that. C.S.– May 7 — I met C.S. in college sophomore year and spent the rest of my time at UM chasing him around. He was really tall, had sparkling blue eyes like Hawaiian beachfront, and was a trivia nut. I learned early on that he had a Derby birthday and spent scads of time filling him in on the particulars: Behave Yourself and Burgoo King, Col. Bradley’s pair from the 30s; Ponder, winner in ’49 sired by Derby winner Pensive and sire of ’56 winner Needles; Swaps, the California wonder. He actually remembered watching the 1994 Derby on TV because rain kept his party inside — I was always excited to remind him that I had “met” that year’s winner, Go For Gin, at a recent Kentucky trip. Seattle Slew is the only TC winner I have seen in person, and his Derby was on May 7, 1977, another thing I probably talked about too much. F.L. — May 11 — I hated F.L. when I first met him. He was too overbearing, had a penchant for telling ridiculous lies, and could be entirely too goofy at times. But as I got to know him, I realized just how misunderstood he was. I found out he had a May 11 birthday and thought he may have a Preakness winner or two. But delving into the stats, I discovered that F.L. shared a Derby with a few early winners, like 1887 victor Montrose and 1892 winner Azra. 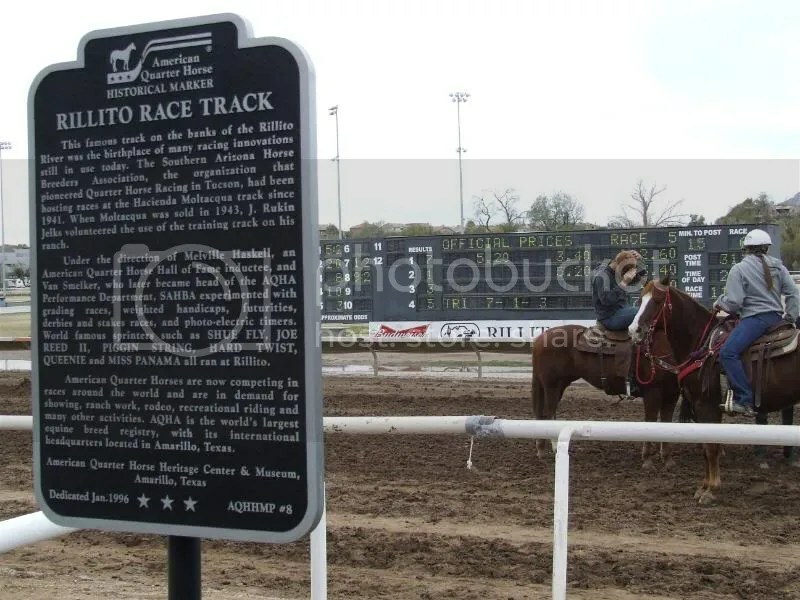 But he also shares a Derby with Exterminator, the 1918 longshot winner who became a national hero. 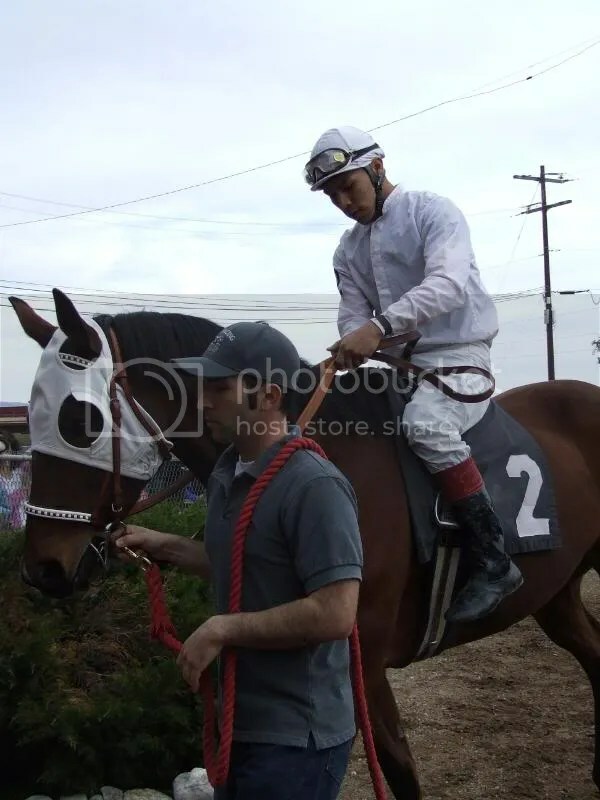 Exterminator got the nickname “Old Bones” because of his coarse, angular frame, and raced only 4 times at 2 before becoming a workout mate to W. Kilmer’s champion 2yo Sun Briar. Unfortunately, Sun Briar developed problems that kept himout of the Derby, and Kilmer reluctantly entered Exterminator. The big brown gelding had not raced at all prior to the Derby, but he was well-conditioned after running alongside the champ for so long. He ran away from the field in the stretch and won by a length, redeeming his supporters and horse-laughing in the face of his detractors. F.L. has a lot in common with Old Bones, except I’d probably call him Honeybun (his girth would probably compare to the horse’s). I’ve been talking F.L.’s ear off about Derby 135 for months. He’s probably glad the race is 4 days away — he needs his ear back. ETA: *Winning Colors, May 7, 1988!